This chapter sets up the general framework in which we work throughout these volumes. 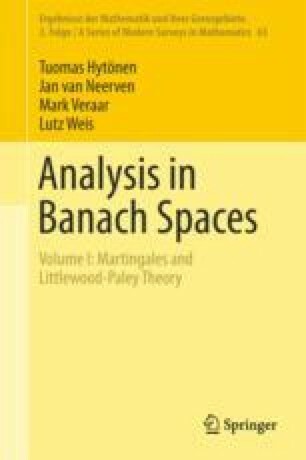 After introducing the relevant notions of measurability for functions taking values in a Banach space, we proceed to define the Bochner integral and the Bochner spaces L p (S;X), which are the vector-valued counterparts of the Lebesgue integral and the classical L p -spaces, respectively. We also briefly discuss the weaker Pettis integral. The chapter concludes with a detailed investigation of duality of the Bochner spaces and the related Radon–Nikodým property.